One of the sources of information we pay less attention to than we should is the expression of complaints. So much easier, of course, if you have a complaints choir. Here are the woes of Helsinki set to music. 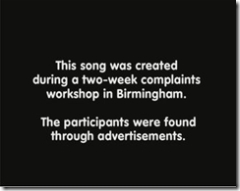 Update November 2010 – and now there’s a complaints choirs album. Unmissable.